Md. Ameer Sheikh, son of Late Sheikh Kazem is an inhabitant of Purba Gangabardi village of Faridpur Sadar Upazila of Faridpur district. At the beginning he pulled rickshaw for 15 years then started a partnership business 12 years ago. He found himself in a grave peril when he lost all his money while doing this business. He had to sell all his lands and other valuable resources to repay the money burrowed for business. Became a landless and jobless person. Under this circumstances, a neighbor fisherman named Khorshed inspired him to involve in fish culture. Fortunately, a known person who lives in Faridpur town allowed him to culture fish in his pond of 150 decimals situated in Purba Gangabarti village on condition. The contract was, Ameer Sheikh will provide all the inputs and share 50% of his production to the owner of the pond. Ameer Sheikh started with zero credit. He burrowed fish seeds from a nursery operator, feeds and fertilizers from local dealers and gave all his efforts on fish culture. At the end of first year of fish culture, Ameer got such a fish production that he successfully repaid all the costs of fish seeds, fertilizers, feeds and other inputs that he burrowed. A major portion of the fish culture pond is shallow and becomes almost dry during dry season. 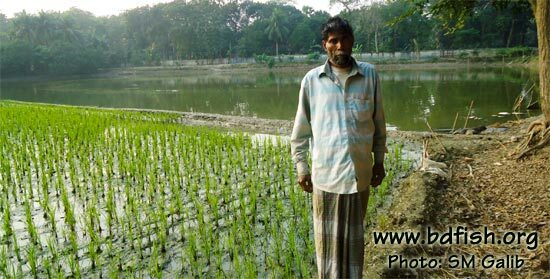 He cultivates rice in this area during dry season. 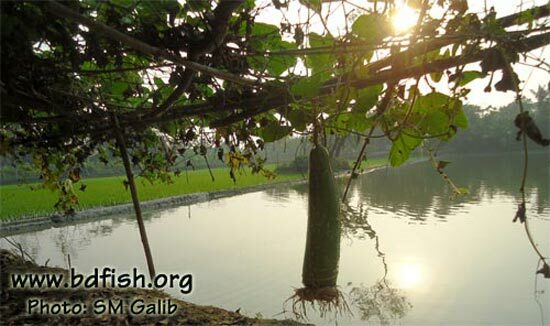 He also planted bean and gourd on the dyke of the pond and getting considerable vegetables production for household consumption. Lately he has leased in another pond of 30 decimals. He has brought two cows and two goats with the money earned by selling fish and planning to buy more livestock in near future. Visited 356 times, 1 visits today | Have any fisheries relevant question?